If you are not embarrassed by your first product, then you've launched too late. Google Bombing is a fine way to learn new things. It is a good way for people abroad to learn a new French term (of the kind you can very easily reuse next time you visit Paris): trou du cul. French people, thanks to wikipedia, will discover that it also depicts a card game, whose synonym is "President". 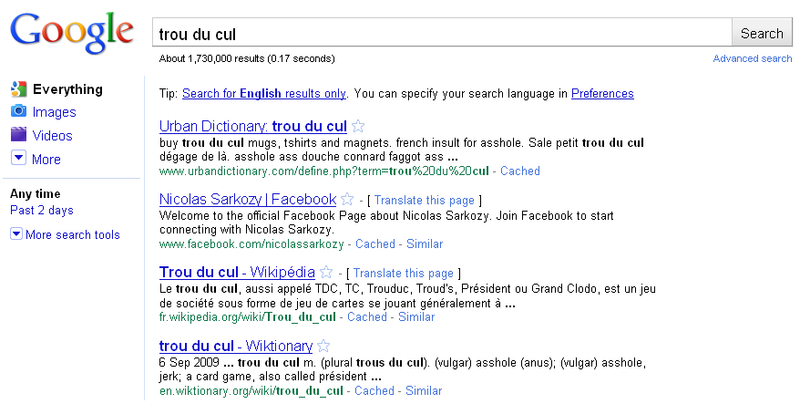 No surprise then, President Sarkozy’s Facebook page appears in a good place when googling for this term. Still wonder if it comes from a smart semantic network at Google, or if it is some kind of plot! You are currently browsing the Blog Odyssée weblog archives for September, 2010.